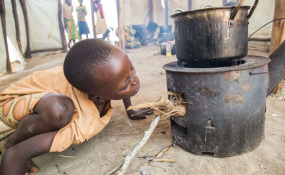 A Burudian child prepares a meal at Mahama refugee camp. Environmentalists are warning about the dire effects of cutting trees for firewood. The United Nations refugee agency reports thousands of Burundians are fleeing instability and abuse in their country as funding to support growing numbers of refugees dries up. The UNHRC warns deteriorating political and human rights conditions in Burundi are forcing increasing numbers of refugees to flee to neighboring countries in search of asylum. The agency reports more than 410,000 refugees have fled across borders over the past two years. UNHCR spokesman Babar Baloch says the number is expected to increase dramatically by the end of the year. Baloch warns Burundi is likely to become the third biggest refugee situation in Africa. The UNHCR reports Tanzania is hosting most of the Burundian refugees with some 249,000 living in three overcrowded camps. Tens of thousands of others are living in Rwanda, Uganda and Democratic Republic of Congo. He says the growing exodus is occurring as funds for his agency’s humanitarian operation have practically dried up. He notes UNHCR has received only two percent of the $250 million it needs. Countries of asylum reportedly have been pushing some newly arriving refugees back across borders. Baloch says that is of great concern. He says the UNHCR is renewing its appeal to them not to forcibly return refugees against their will to Burundi where their lives may be in danger.